The Wolowski family has been lighting the cherry tree in their Ronkonkoma front yard with pink lights throughout the last three holiday seasons to inspire cancer awareness and to celebrate recovery and living cancer free. 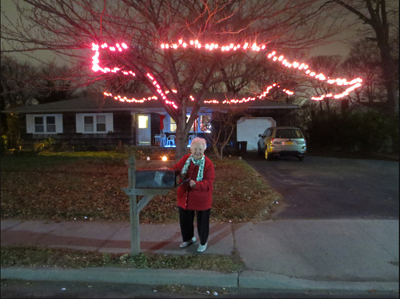 Ronkonkoma senior citizen Theresa Wolowski, along with her son Ryan Woloski began lighting the cherry tree in her front yard in pink three years ago to honor a family member, Maura Woloski, who died of breast cancer. The Wolowskis have continued to light the tree each year with one modest strand of pink lights draped across lower branches to look like a pink ribbon, hoping for it to serve as a sign for cancer awareness. “We are hoping this pink tree will make it easier and more likely that folks with be able to talk about breast cancer with their family members as well as their doctors,” Theresa said. For the Wolowskis, the tree is a reminder for the community to discuss the disease with family members as they gather for the holidays and to encourage loved ones to get cancer screenings. Each year, the Wolowskis assign a theme to the tree lighting. The theme of first tree lighting was awareness. The next year’s theme was recovery, and this year the theme is living cancer free in wellness. "This is the best year, this is the year for wellness," Theresa announced before officially lighting the tree shortly after midnight on Dec. 1. Subject: LongIsland.com - Your Name sent you Article details of "Pink Lighted Tree in Ronkonkoma Hopes to Raise Awareness During Holiday Season"